We are delighted to provide for the dental needs of our child patients under the NHS. We are delighted to provide for the dental needs of our child patients under the NHS.The dental health of our younger patients is very important to us so they can grow up with a happy and healthy smile. As well as encouraging regular 3 month check ups to monitor and track any changes, we make visits as pleasant as possible, wherever possible outside of school hours or during school holidays. We also run regular open days for children to ensure that good oral health habits are established at an early age. We explain how to clean teeth correctly and also discuss the importance of a healthy diet and the need to avoid sugary food and drinks. To reinforce this message, we offer free fruit and water at the Practice, available to all our patients. As the parent or guardian you are responsible for brushing and flossing your child’s teeth up until the age of six or seven. It is just two minutes twice a day and it is well worth persisting to ensure that your child has a great dental health routine, which is then established for the rest of their life. Our team of Dentists, Dental therapists and hygienists are all very friendly and approachable and are more than happy to answer any questions you may have about your child’s teeth. To arrange an initial appointment for your child at the Practice, please call our Reception team on 01457 837361. Is the dentist free for children? Currently at Mossley Dental we offer free NHS treatment for children as we are contracted by the NHS to provide general dental care for children. Although we do our best to accommodate everyone who needs treatment our contract is limited by levels of dental activity. Private options are also available. What dental treatments are available for children? 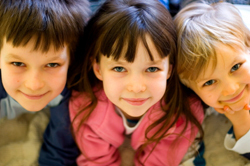 We offer the full range of general dental and orthodontic treatments for children. We practice a preventative dental approach which means that we do our best to educate our patients about the best way to keep their teeth and gums healthy so hopefully they never need treatment. We have a number of dental hygienists and therapists that work at the practice who provide preventative advice including tooth brushing instructions and oral hygiene advice. If necessary we can carry out any necessary restorative treatment for children of all ages. What age should I bring my children to the dentist? We are happy to see babies from a young age and usually encourage their parents to bring them to their own check-up appointments so they can get used to the environment of the dentist. If you bring your child to the dentist from a young age we can help advise you on best tooth brushing technique and dietary advice.